That's my little one, or I should say my oldest daughter, M. She's really into trying new styles with her longer hair, and this is her beautifully designed and executed side bun. She accomplished this smooth styling on her first try. She has since tried it five, six, ten, maybe even twenty-five times with no success. 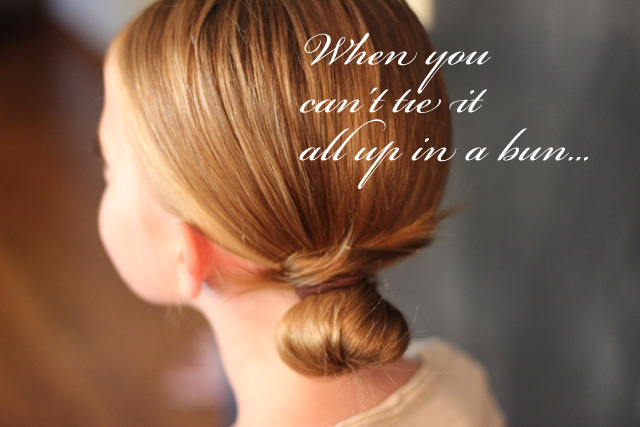 Sometimes the ponytail bubbles or she can't hold all the layers tight as she wraps the holder around the mound of hair. Other times she thinks she has it all wound just as she wants it, only to step down from the stool and have it all fall out. And as much as I get frustrated with her for spending so much time on something I consider an unnecessary concern for a seven year old, I had the opportunity to be in her shoes these last 24 hours. I'm writing this with my Z pack of antibiotics next to me as I battle through a third round of strep throat in three months. I have never had strep prior to this year! M is upstairs sleeping off a bad bout with a gastrointestinal bug that dehydrated her and kept her out of school for a couple of days. I like my challenges to be neat and tidy. I like it when there's a clear solution to a problem. I like to move quickly to resolution. Illnesses, your own and more poignantly your children's or loved one's, remind me that life is not about everything fitting neatly into the bun. Life is messy and complicated and tragic and annoying and beautiful and unbelievably amazing all mashed up together in a great big bowl. As M was struggling to calm her nerves and stomach pains last night, she asked me to rub her feet. As a baby she'd always loved having her feet massaged, and I have many rosy mental pictures of her smiling baby face, enjoying the snuggles. But she's a big second grader now, and she's independent and already letting me know where she does and does not want my help. But for one night I was allowed to sit on her bed and rub her feet again. I got to watch her perfect face fall asleep and peek over as her little sister, all curled up under her covers, slept soundly unaware that anything was amiss. I knew it was one of those moments I'd treasure because it felt so fragile, so fleeting, and so precious. I had plans and I had lists of things to do that just didn't happen, and instead I now have a warm memory of my slumbering little girls and an unexpected moment of grace. And I have an appreciation for all those happenings that don't fit in my neat and proper bun.